Epic Games just released a new tech demo of sorts for Unreal Engine 4. There's something different about this compared to the usual visual splendor of most of Epic's Unreal showcases, however. Something much more...flappy. That's right: Epic Games, the studio behind juggernaut titles like Gears of War and Unreal made a Flappy Bird clone. It's called Tappy Chicken, and it's free to download on the iOS app store and Google Play right now, with a browser version on its way as well. This news is curious. Throughout its storied history, Epic has done an incredible job positioning the Unreal Engine as the industry standard for software products that help make video games look pretty. Its flagship mobile gaming title Infinity Blade has set a lofty standard for fun and visually stunning iPhone and iPad games—one so high that it earned itself an enviable position of being one of Apple's guests of honor at many press events engineered to show off the power of those two devices. The commercial and critical success of Infinity Blade is often cited by industry analysts as a counterweight to the overwhelming trend of the entire mobile game ecosystem being dominated by titles that feel slight—work that's cheaply made to amuse people for a few minutes on their daily commute and nothing more. So why bother making a clone of a game that seems to epitomize that side of mobile gaming? In its press release for Tappy Chicken, Epic said that the game is meant to be "the perfect showcase for the ease of use and flexibility of Unreal Engine 4." "While it may not flex the full graphical muscle of the engine, it shows how almost anyone can make a fun and pretty game fit for mobile devices and web browsers," the statement added. Tappy Chicken is therefore intended more as a demonstration of UE4's awesome power than any statement about the quality of Flappy Bird or the time and care that Dong Nguyen, the game's now infamous creator, put into it. I have a hard time separating the two, however. Nguyen's game sparked an incredible amount of soul-searching and flat-out anger in the mainstream game industry both because of how stratospheric its ascent to the top of the iOS charts was and how efficiently and, to many, inexplicably Nguyen achieved that success. He claimed to have made the game in just three days. By the time he pulled it from the app store, he said he was making $50,000 a day off the thing. And with the power of Unreal Engine 4, Epic's statement suggests, maybe you can too. 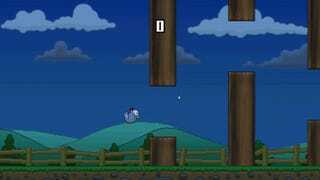 There are a handful of Flappy Bird clones or Flappy Bird-inspired games that are genuinely fun to play. But Tappy Chicken is not one of them. I've been toying with the game today, and it pales in comparison to the version of Flappy Bird I still have installed on my iPad. But don't take my word for it. For a second opinion, I reached out to my friend and Flappy Bird fanatic Jeremy Gordon, whose score in the game (233) is the highest of anyone I've actually met in real life. I've seen him play the game on multiple occasions, so I can attest to his phenomenal ability to make the bird flap. One night he went as far as taking my iPad and playing the game there just to challenge me to try and beat the score he stuck atop my personal leaderboard. He got 85. I still haven't topped that. Believe me, I've tried. "This is horrible," he texted me shortly after I asked him to check out Tappy Chicken. "It's so slow—the chicken flaps like a hot air balloon, the speed is half as fast as other Flappy Bird." "Impossible to maintain a rhythm," he added a moment later. "It's like when you find a Pac-Man arcade machine and it turns out to be half speed and you're so demoralized you just leave without finishing it." "Offensive to the concept of Flappy Bird IMO," he concluded. Ok, so maybe trying to replicate the genius of Flappy Bird is harder than we all think. But does that even matter? "It's probably not meant to be played," Ian Bogost, a video game scholar who's written eloquently about the allure Flappy Bird, told me when I sent him a link to the game. "It's an ad for the engine." That's a good point. And again, it's Epic's stated intention in making Tappy Chicken. But the fact that one of the most influential companies in the game industry couldn't make something half as good as the title it was explicitly emulating doesn't sit well with me, considering how harshly many critics and industry insiders—including people here at Kotaku—responded to Nguyen's unexpected success. Making games—even seemingly small, stupidly fun games—is hard. As far as I can tell, nobody has met that challenge quite as expertly as Nguyen did when it came to making a game like Flappy Bird. Maybe someone will, now that Unreal Engine 4 is further democratizing the process. But until they do, I'm just going to remain content that the original—and best—version of Flappy Bird is finally coming back to the app store this summer.